Pet owners and human parents of the world: Do you ever discomfort yourself merely to not inconvenience your pet/child while they do something adorable, endearing, or peaceful? An example of this for human parents is that you might not move from an uncomfortable position on the couch just because your infant son/daughter fell asleep on you, and you don’t want to wake them up. Sometimes I sit back down, and he goes elsewhere. 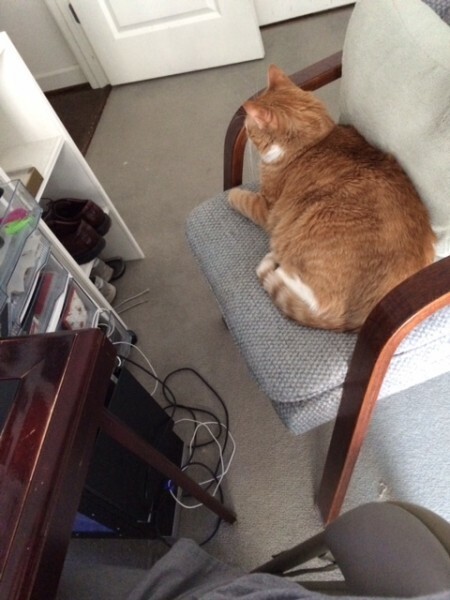 But sometimes (like today) he just looks so comfortable–like the chair were custom made for him by little seamstress mice–that I simply slide the chair to the side with him on it. I then pull up a less comfortable folding chair and continue working as long as Biddy claims the desk chair (usually 2-3 hours). I’m sure I’m not the only pet owner or human parent who does this. What’s an example of your animal or child putting you in an uncomfortable position that is totally worth it because of how happy they look? This entry was posted on Thursday, August 27th, 2015 at 10:06 pm	and is filed under confessions and tagged with cats. You can follow any responses to this entry through the RSS 2.0 feed. Just about anytime I decide to stretch out on my couch, Jasper chooses my lap or legs as his favorite nap place, which is adorable but also leaves me stuck in one position for longer than I may have planned. I usually just admit defeat because he’s so sweet, and this ends up being how I’ll sit for hours: http://tinyurl.com/nmvhq2o I have learned to keep my laptop handy on the coffee table when there’s a chance he may immobilize me, which means I can at least turn the tv off and do more productive things without disturbing him. That’s neat how you keep your laptop nearby because you know you’re going to get stuck in that position from time to time. 🙂 And very considerate of your cats! They say the difference between dogs and cats is that a human can train a dog but a cat can train a human. I often think that my cats Odie and Buddy think of my husband and me as their pets and not the other way around. I don’t mind though. I am happy for the scraps of attention they give me. And yes, I have given up my seat for them too. Sandra: That’s awesome–I don’t think I’ve heard that before, but it totally makes sense. Sometimes I’ll get up in the middle of the night to go pee and when I get back to bed I find both of cats asleep on the bed in places that means I have to snake my way back under the covers into a Z shape so I don’t wake them up. It’s not comfortable in the slightest but I like hearing them snore away as I fall asleep.